Learn about the annual Staff Associations Diversity at Work Luncheon. 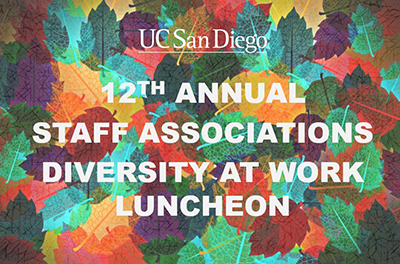 Please join us for the 12th Annual UC San Diego Staff Associations Diversity at Work Luncheon. Description: Come celebrate the diversity of UC San Diego staff. Enjoy community connections, cultural conversation, diverse cuisine, music and giveaways. $10.00 each - Space is limited, please reserve now! Tickets will not be sold at the door on the day of the event. The Flavors of Diversity is jointly sponsored Black Staff Association (BSA), Chicano/Latino Staff Association (CLSA), Pan Asian Staff Association (PASA), and the Cross Cultural Center at UCSD. For more information, contact Nancy Magpusao, 858-534-9689.